1 A.M. is one of Chaplin’s best-known early short films. It is essentially a one-man, one-act play. Chaplin is the lone actor on screen for the last twenty minutes of the 24-minute short. The gags revolve around Chaplin, very drunk and massively confused, attempting to navigate his way upstairs and into bed. The attempt is reminiscent of Sisyphus, perhaps during one of his lighter moments. 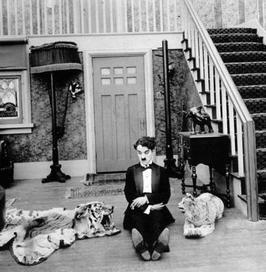 I felt no frustration, of course, in Chaplin’s failures to get up the stairs or into bed. Instead, all of the charm and laughs come in the endlessly inventive ways he is stopped from completing his task. Watching the technique of a master displayed so explicitly is most of the fun. There are no side-characters, no (live) animals, and no romances. It’s just Chaplin making use of every gadget and piece of furniture he could get his hands on. My favorite gags were the failed attempts at actually climbing the stairs. Very few comedians of the time (or since) have had the kind of body control that Chaplin possessed. He truly mastered the teeter, slip, tumble and crash. His signature, twitching facial expressions are the cherry on top. And on the other side, he approaches important things with childlike innocence. At the blink of an eye he turns a fight into a dance, is easily hornswaggled by a conman with a sad story and runs the dishes through the dough-roller in an attempt to be “helpful”. One of my favorite bits includes a coin toss in which Chaplin momentarily loses track of the coin. And, in a particularly subtle shot, Chaplin casts lewd glances at the rear-end of Edna Purviance’s character, even as she is patting his cheek and calling him a “poor child”. Both shorts defy modern critical reviews or star-ratings. But I’d highly recommend them both, as either silent film starters or for Chaplin fans that haven’t seen them yet. This entry was posted on January 24, 2010 by Ian Kay. It was filed under Chaplin Shorts .